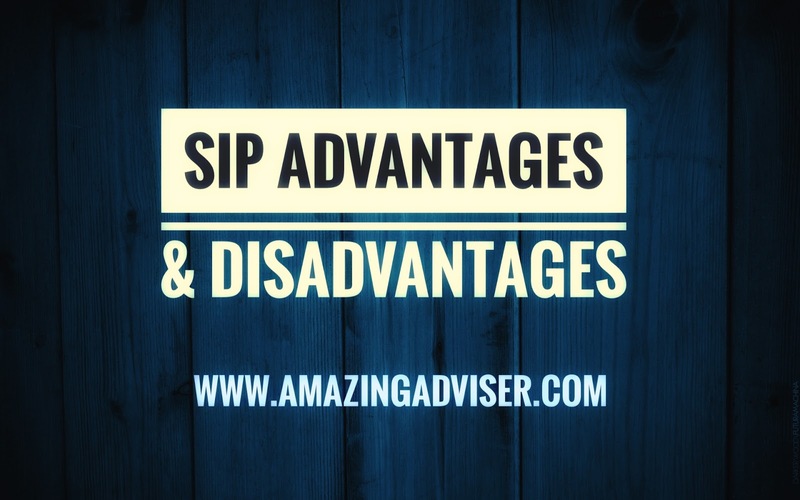 Hello friends, in this post we are going to discuss about SIP, its advantages and most importantly which no one will say you, its disadvantages. If I will explain the true meaning of SIP then it will be similar to Recurring Deposits. SIP is modern era's RD. So what does SIP do? In SIP a professional invest money in capital markets on behalf of his/her clients. It's as simple as that. It's as simple as planting a small tree. It is as simple as taking care of your small baby. Safe From Market Fluctuation - One of the most important and remarkable advantage of SIP is, it saves you from market fluctuations. Ups and downs are always happening in markets but if you are doing an SIP, that means you are systematically investing money in all ups and downs of market. So ultimately your buying costs will be averaged out. And it will only happen if you will remain invested for atleast 15-20 years. Small Investments - In India SIP can be created with a minimum of ₹1000. And believe me that's very small account like our traditional investment RD. Most important thing is your ₹1000 is further invested in different company by diversifying your portfolio by your mutual fund manager. You can even start and SIP in ELSS category with ₹500. I suggest to students to start SIP in ELSS. Believe me its beneficial than all investment options. Tax Exemption - This is a welcoming step by Indian Government that you get tax exemption if you invest in ELSS that is equity linked saving scheme. You can claim expemtion under section 80C upto 100000 per annum. Expertise of Experts - There is no need to pay lakhs of money to professionals. Because your 1000 is managed by industry professionals with vast experience. So you can assume at least your money are in safe hand from rest of the peoples who invest directly in stock market. Portfolio Diversification- It is well said " Don't put all your eggs in one basket." We all know this but how many of us understand it? I have personally saw portfolio of peoples and I'm surprised that only 1 among 20 peoples has a portfolio of stocks. Rest have 4-5 stocks in their portfolio. But when you invest in SIP as I have already mentioned your money are invested in 50-100 stocks. So your risk will be significantly lower than rest of the crowd. Timing of market- Though there are many benefits of SIP still it has some drawbacks. Firstly timing of market. This means assuming everything is constant, if you have started your SIP in bull market that is when market is trading in all time high then there is a chance that your return will be lower than those who have invested in bear markets. Short Term - SIP is not ideal for short term. In my opinion if you are doing SIP then please keep in mind that you have to give it time. Make sure you continue a SIP for atleast 15-20 years. If you have time like if you are of age below 30 then continue your SIP for 25-30 years. Then only you will be benefited. That's all for today. Thank you for your time.